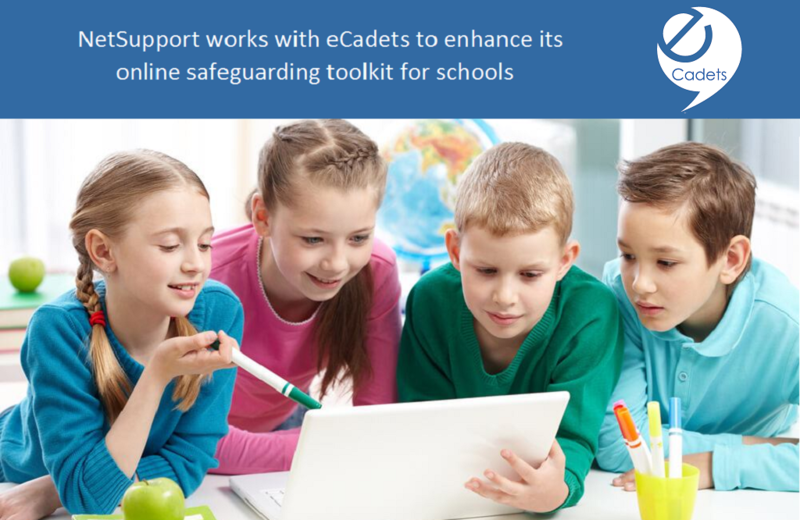 NetSupport works with eCadets to enhance its online safeguarding toolkit for schools. NetSupport is pleased to announce that eCadets, the UK-based school online safety peer empowerment programme, founded by Henry Platten, will be working with NetSupport to enhance its online safeguarding toolkit for schools. The constantly changing landscape of safeguarding trends and policies, combined with an increasing need for digital citizenship awareness and implementation is a pressing matter for schools. Safeguarding topics that students may be searching for online (e.g. suicide, eating disorders, radicalisation and so on) vary hugely from school to school, but so does the terminology used to describe them – making it difficult for school staff to keep track of exactly what is being discussed and whether or not it should be a concern. Supporting schools with this challenge is NetSupport’s safeguarding toolkit (within network and IT management solution, NetSupport DNA) which contains a range of proactive and reactive tools such as keyword and phrase monitoring, internet controls and online resources. Working with eCadets, which has a wealth of safeguarding and digital citizenship knowledge from helping millions of children across the UK and internationally to stay safe online, NetSupport will ensure that its tools continue to remain up to date with new trends and terms to support students and teachers. eCadets will also support the creation of helpful guides and articles with hints and tips for schools to further support their policies and approach.